Thanks to my last week of paternity leave and a well behaved baby, I can actually write posts instead of just drawing dongs (don’t worry, the dongs are coming). I guess I could totally regret this post once the Padres are raising the 2014 World Series trophy after a Ken Caminiti-esque MVP year from Chase Headley. But here in the world of reality, I keep seeing mentions on the Tweeter and within the blogosphere, local and national, that keep pushing the Padres to extend Chase Headley. Change The Padres, a movement I fully support, has made it a bellwether for the new ownership’s supposed commitment to winning. I still remember when Chase was called up to play left field (we clearly couldn’t displace Kevin Kouzmanoff at 3B) and became our great hope for the future. What we got was middling power, a decent glove, and OK average which we would blame on him playing out of his natural position of 3B. Then at 3B, we get the 4 HR season (granted with an OPS of .773). I’d say Headley mania had bottomed out around then. Out of nowhere, we get the 2nd half of 2012 where Chase became Caminiti reincarnated, but without all of that awesome crack. The clamor picked up to extend him NOW (at the height of his value). Thank christ the team waited, and we were treated to another moderately above average season at the plate. Word on the street is that signing Chase Headley would take about $15 mil a season, or about what we paid Chan Ho Park his last season in San Diego. Now Chase Headley doesn’t want to negotiate until after the season. And yet people are yelling at the Padres for not committing to our “star”. Newsflash, here are his Baseball Reference comparables: Mark Teahen, Gabe Kapler and Terrence Long. YES, FORMER PADRE TERRENCE LONG. Can you imagine what the reaction would have been like if in 2006, Kevin Towers announced to the world that he was signing Mark Teahen (after his best season) to the largest contract in Padres history?! I get it, Chase Headley is homegrown and we’ve gotten to see many disappointing seasons out of him plus one totally awesome one. Thinking he even wants to re-sign here and pass up a free agent bonanza is wishful thinking at best. A 36 year old Carlos Beltran with similar OPS+ last season just got $15 mil a year, you don’t think Chase Headley can beat that? Even with it being reported for well over a year now that the Yankees like him and need a 3B? It’s time to move on. 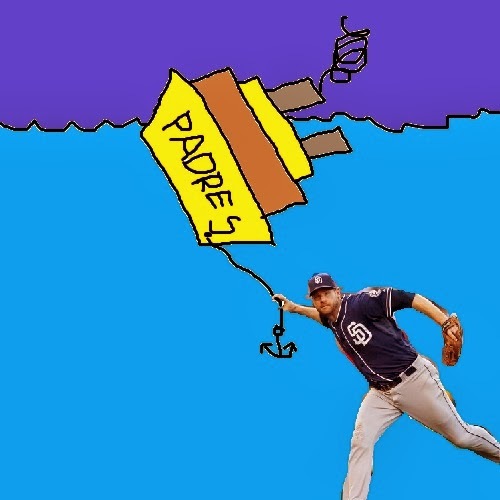 He’s not going to be here next season, and if he is, it will have been a colossal mistake that will sink the Padres for years to come. As long as Mike Dee and the Padres ownership keeps payroll where it’s at, a $15 mil mistake is a franchise killer that will force the team to be even less active than they already are (granted, they are really great at committing 25% of the payroll to closers) in free agency. Hedge the risk, ship him off while you can still get something for him, and start getting Jedd Gyorko to take infield at 3B. And then, unlike past Padres ownership, actually spend that money on player acquisition (international, free agency, wherever) instead of pocketing it and reinforcing the Padres position as most profitable team on the Forbes rankings. P.S. It should be noted that Chase Headley is a really nice dude. I’ve met him, he’s cool. But we’re chasing championships here ideally.